“But no temple made with hands can compare with Yosemite,” wrote John Muir, the naturalist and “Father of the National Parks.” Massive granite domes, plunging waterfalls, towering groves of sequoia trees and peaceful alpine meadows all combine to create an aura you won’t find anyplace else. One of the best parts of Yosemite is that it offers something for just about everyone — from rock climbers scaling El Cap to the watercolor artist painting a field of wildflowers to the just-plain-curious taking it all in at the park’s iconic Tunnel View. With so much to choose from, we narrowed the list to eight can’t miss experiences in Yosemite. The granite domes of Yosemite are among its most iconic features. While the most famous of these is Half Dome, the ease of the climb (about 1,000 feet elevation gain) and relatively few number of hikers to contend with make Sentinel Dome a nature-lover’s favorite. From the top of the dome, Yosemite’s greatest hits play out all in directions. You can look down Yosemite Valley to El Capitan, Half Dome and Nevada Falls and a saw tooth range of High Sierra peaks in the distance. Even better — take the hike with an expert naturalist guide by your side to have a deeper understanding of the landscape. It was previously the Ahwahnee Hotel and is now named the Majestic Yosemite Hotel, though whatever it’s called, this crown jewel of a lodge is National Park rustic architecture at its best. The 34-foot-high beamed ceiling with large sugar pine trestles complement the dining room’s granite pillars, floor-to-ceiling windows, chandeliers, linen tablecloths and beautiful china. All together it creates the perfect ambiance for a memorable dining experience. After your meal, take an expert-led tour of the Ahwahnee’s great rooms with their exquisite Indian basketry displays and elegant stained-glass windows. Whether roaring, plunging, or even trickling, the falls around Yosemite are some of the most delightful features in the park. Come in the spring when the snow melt supercharges the falls and you’ll see just how beautiful and thrilling water, rock and light can be. If you want to be a passive observer, you can admire the falls from a distance in Yosemite Valley, or lace up your boots for a hike to get up close. One of our favorite hikes is to Vernal Falls, where rainbow-infused mist is guaranteed to stop you in your tracks. The majesty of Yosemite comes at a price — a record 5 million visitors in 2016. Experience Yosemite without the crowds and in the beauty of her snowy coat in winter. The intensity of the sun and mass of tourists of the peak seasons give way to a whole other world in winter — a world of solitude and quiet. And what better way to celebrate the New Year than by having one of nature’s most beautiful places mostly to yourself. No trip to Yosemite is complete without standing at the base of a Giant Sequoia and tilting your head straight back to take in some of the oldest and most massive living things on earth. Two of the grove’s trees are among the 30 largest Giant Sequoias in the world. The biggest in the park — Grizzly Giant — towers more than 200 feet in the air. There are few more picture-perfect places than Yosemite. We all aren’t Ansel Adams, but with the right instruction, frame-worthy photographs can be found around every bend. Meet up with a professional photography instructor to learn how to create the “cotton candy” effect of a fast-moving stream, or harness the sun to create shots of the “fire” on El Capitan and of the granite monolith Half Dome in the final light of day. Yosemite Valley is home to the most recognizable features in the park, but many say the heart and soul of Yosemite is Tuolumne Meadows — a high country of granite domes, alpine meadows and cooler days and nights in the hot summer. 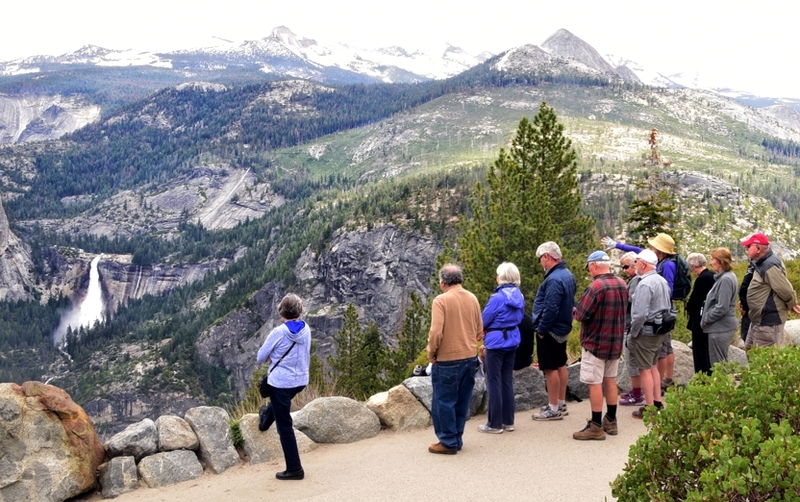 Follow Tioga Pass Road for a 39-mile scenic drive to the meadows, and be sure to stop at Olmsted Point for a very different perspective on Yosemite Valley. Tuolumne Meadows is a sub-alpine meadow threaded by the winding Tuolumne River. Majestic peaks and domes surround the meadow, making it a perfect jumping off point for hikes into the High Sierras. No visit to Yosemite is complete without attending a campfire talk led by one of the park’s outstanding naturalist Park Rangers. Good cheer and an enthusiastic crowd surrounding a roaring fire make the perfect backdrop for a fascinating lecture. Whatever the topic — birds, bears or bees — you’ll have a great time and learn a lot. To get the most out of the experience, bring a child or grandchild and expect some fun audience participation. This is a true Yosemite tradition not to be missed. Want to experience Yosemite with the experts? Try a learning adventure with Road Scholar provided by the ECCO Conference Center. ECCO is a center of renewal and beauty, where education, growth, service and prayer come together for the glory of God.